School staff at Annbank Public School, Annbank Road, Mossblown. 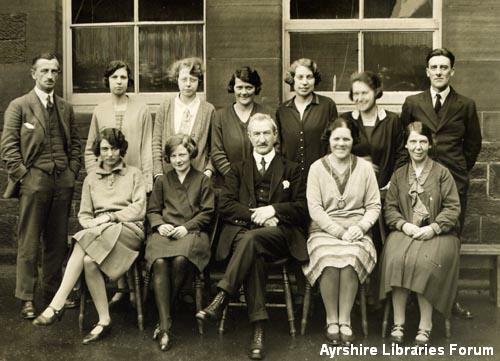 Back Left to Right are: Mr Cochrane, ?, Miss Browning, Miss Anderson (Mrs Gallacher], Miss Mitchell (Mrs Robertson), Mr Hyslop. In the front row from the centre to the right are: Ronald McArthur, Mrs Henderson, Miss Bruce. Do you recognise any of the unknown figures?